Normally, I don’t open with box art. However, this is a special occasion. So, to whet your whistle, check out this teaser for the vannin’ road ahead! I’ve said it before, and I’ll say it again: Vannin’ was, and is, all about extremes. Bigger tires, bigger murals, bigger fender flares, more crushed velour and shag carpet… the world of custom and show vans is almost like a parody of an arms race! Whether it was side pipes or turbine mag wheels, over-the-top paint work or nearly pornographically suggestive interiors, Vannin’ and Vanners knew no bounds. That’s one of the things that made Vannin’ so fun, and that “everything goes” attitude wasn’t limited to only the world or real vans. Oh no. It spilled over into the world of scale vans as well. Back in the time of disco and awful, emissions-regulations-choked pseudo-street machines, models weren’t just for adults, the way they largely are now. They were for kids, too. To keep current with the youth of the day and keep their market share, it was imperative that the model companies tuned into what was hot on the streets and mimicked those trends in styrene. That explains a lot of the weird (especially MPC) customs that were offered in the ‘70s, where show-roddery, IMSA flares and plain old boundless tastelessness combined in a post-psychedelic cyclone of automotive disfiguration. However, it wasn’t just wanton Street-Freakery that had the kids all in a buzz. Nope, there was another scene the model makers had to get in on; Vannin’! Vannin’ was customization taken to the extreme. It centered on the transformation of the most humble, unstylistic vehicles of all (the humble slab-sided cargo van) into centrepieces of interior and exterior design that would make Salvador Dali blanche in reaction to their excessiveness. For model companies, Vannin’ seemed a natural, and lucrative, trend to emulate. Think about it. A van is simple to mould; just make a box, add some custom wheels and decals, and you can sell numerous different variants of the same kit with minimal effort! Thankfully, though, that cut-rate approach was only used on about half the kits available. A big part of Vannin’s creativity and appeal has to do with what’s on the INSIDE. A van kit without a neat, full custom interior is about as much fun to build as, well, a box with decals on it. Why bother, really? It was this reaction, or the anticipation of therein, that led many kit makers to make full on, crazy custom van kits with radical interiors. 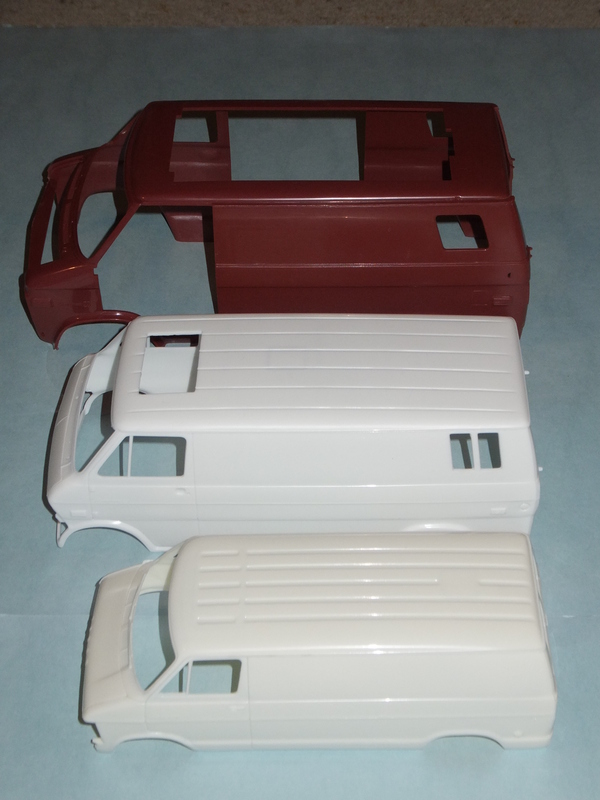 Some of these were the 1/25 MPC Dodge Van family (like Bad Company and Gold Rush), as well as the Monogram GMC/Chevy Van (like Sundance Express). Then, there was the 1/20 Econoline family that MPC put out (like Highjacker), a step up in size and detail to other kits available. How does one counter that? As a model company looking to take back the crown of scale-Vannin’, there was little anyone could do that was much more extreme than MPC’s 1/20 vans, such as Visible Van and Wizard. They had full interiors, open or glassed-in roofs, and detail that was both innovative, realistic in terms of replicating real street vans, and was in such a scale that it could all be clearly defined and enjoyed. So, the answer was simple. If you couldn’t get better, get bigger! Some say size doesn’t matter. I’m sure an equal and opposite number will disagree. However, when it comes to creating a first impression with a model kit, size is a good way to go about it. Thus, to counter the 1/20 MPC kits, Revell came up with the 1/16 Street Van series. Large kits were quite popular back in the day; I can remember my Uncle having several 1/16 cars. It only made sense to offer a van in that large a scale. As a result, the “Big Bad Van” was born. It was radical, inside and out, with a custom grille and hood, and a crazy interior with a bedroom, sink and all kids of extras. Just like in any endeavour, though, you can’t rest on your laurels. To ensure the 1/16 Van’s continued primacy in the world of scale Vannin’, Revell took it one step farther. They retooled Big Bad Van with “Big Rig Styling”, adding a semi-like grille, gas tanks and smoke stacks. They made the interior even more radical, with more of an “old west” feel. They called it “Movin’ Out”. It was extreme taken to extremes; extreme in size, extreme in style, extreme in detail. It was a creation that has to be seen to be believed. I have heard of Movin’ Out, and seen the odd image online. There’s also a smaller “big rig” styled van kit, but that would be a weak second place compared to the real thing. I have long looked for a Movin’ Out at model shows, swap meets and anywhere else classic sprue can be found. Until recently, though, it remained elusive. Then, I found one at a toy show in Woodstock Ontario. It wasn’t perfect, but it was more than good enough for me. I bought it and couldn’t wipe the smile off my face for days. So, let’s take a look at this amazingly overwrought piece of both Vannin’ and model history, and let’s see just what happens when you scale the peaks of scale Vannin’ and get to a point where the air is so thin, things like this can’t help but happen! If there’s one thing I can say for most Street Van kit boxes, it’s that they’re pretty boring. It’s a picture of the van, and that’s about it. Now, given how crazy some of these vans are, that’s usually enough. However, when you have a box lid as big as the one on Movin’ Out, you need more. 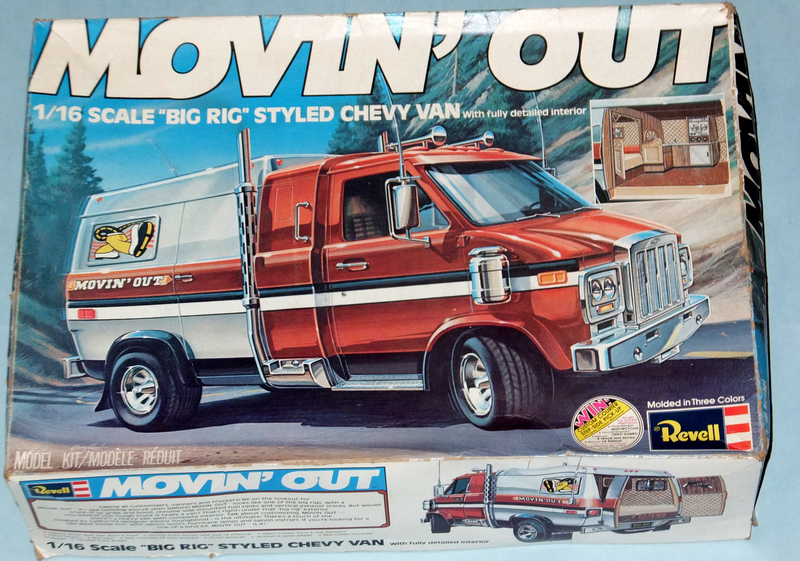 Thankfully, the artists at Revell realized this and created a great piece of box art for this, the “Vanliest” of vans. The main focus of the illustration is, of course, Movin’ Out as seen from the side, with some front end showing too. After all, the point of the kit was the “big rig styling”, so it is definite that this would be prominent. That, folks, is a crap-tonne of van comin’ at ya! It’s so manly and vanly, even the great outdoors can barely contain it! There’s no mistaking the creative talent of Kenny Youngblood, from who’s fertile pen the concepts for this brute-nosed cruiser sprang, likely fully-formed. Gone is the stock grille, and even Big Bad Van’s custom grille. Now, there is a full face-on blast of semi-truck goodness. There’s a tall (and oh-so-Kenworth-y) big rig grille and four big round headlights to highlight the fact that this is no mere girly-man van. Add to that the tall smokestacks and the big rig-esque round fuel tanks, and it’s hard to tell exactly what you’re looking at. There are some other external differences, as well, between Movin’ Out and a normal Chevy van. There’s some “sleeper cab” detail behind the main doors, and the roof is bumped up and adorned with marker lights, just like a real trailer. Adding to the effect is the fact that the “box” (i.e. the back of the van) is done in a different colour. Air horns (of course! 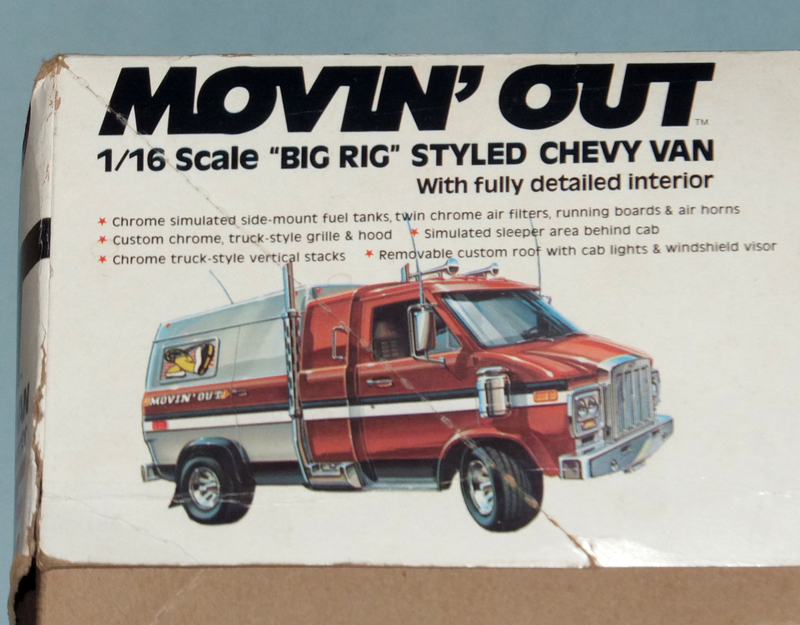 ), a sun deflector and a big chrome air filter (or at least a look-alike canister) all add to the impression that Movin’ Out is serious Vannin’ in the extreme! However, there’s also a nice bit of background. It seems like some kind of mountain highway, a lost two-lane blacktop in the pine forests of the Rocky Mountain foothills or something. It’s very woodsy and northern looking; it reminds me of my grandfather’s cottage near Perry Sound, Ontario. This doesn’t at first, seem out of place. A van this manly would surely be at home in the rugged wastes of wherever manly men are to be found, right? 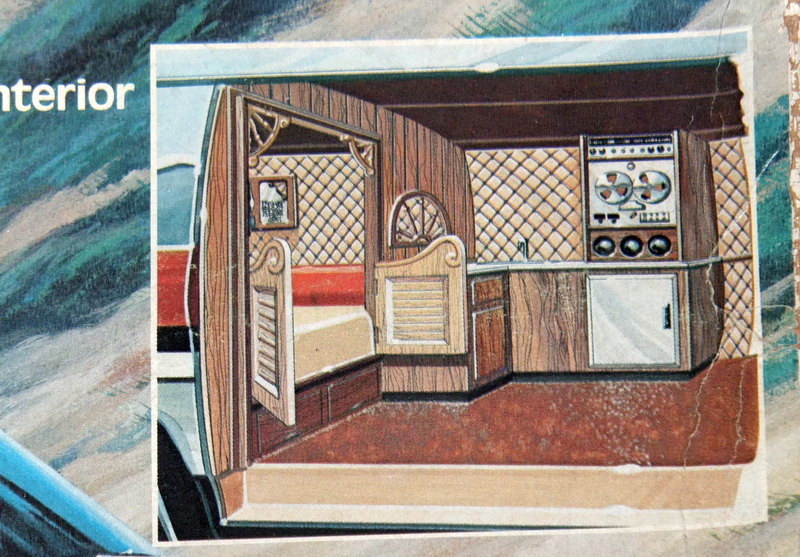 The only thing is that it doesn’t make a lot of sense given the “western” theme of the van’s interior. Still, it looks cool. What’s really interesting is that, despite the thickness of the box, there wasn’t enough room on the sides to show all the interior shots. This means, right on first sight, you can start to get a feel for some of the awesome styling that is going on inside the walls of Movin’ Out. And talk about leading with strength! Just under the almost obscenely large “Movin’ Out” writing, there is a picture of the van’s “entertainment center”. That’s right, there’s a sink, some cupboards, and, of course, a reel-to-reel tape player! If that’s not enough, look at the left of the image where the doors to the “bedroom” are located; these doors are swinging saloon doors! To top it off, you get a feel for the shag carpet, and the de rigeur diamond-buttoned leather (<cough> Naugahyde <cough>) walls. One look, just this one picture, gives you an instant appreciate of what you can expect. This is the teaser image for the interior of Movin’ Out. that’s serious shag, both in the flooring, and through those saloon-themed doors. 1.) Crossed pistols on the wood panelled door. How’s this? You’ve got more diamond-tufted Naugahyde than should be allowed by lawn, and wood panelling to boot! Here’s where the magic happens… just inches from your knees! (Insert joke here…) That wiring’s not just for show, either. It’s also in the kit! In case you wondered what you were getting into, this small info placard should make it pretty clear. Clearly, with a van this awesome, you’re winning the second you own one. However, when Movin’ Out first hit the shelves, there was even more reason to buy it! On the lower right corner of the front of the box is a sticker for a contest. What kind of contest could you have on a big van kit, you ask? Well, a contest to will all kinds of boffo stuff, including: various 8-track tapes; Fairchild video games (WTF? ); CB Radios (of course!) and even Harley Davidson dirt bikes! 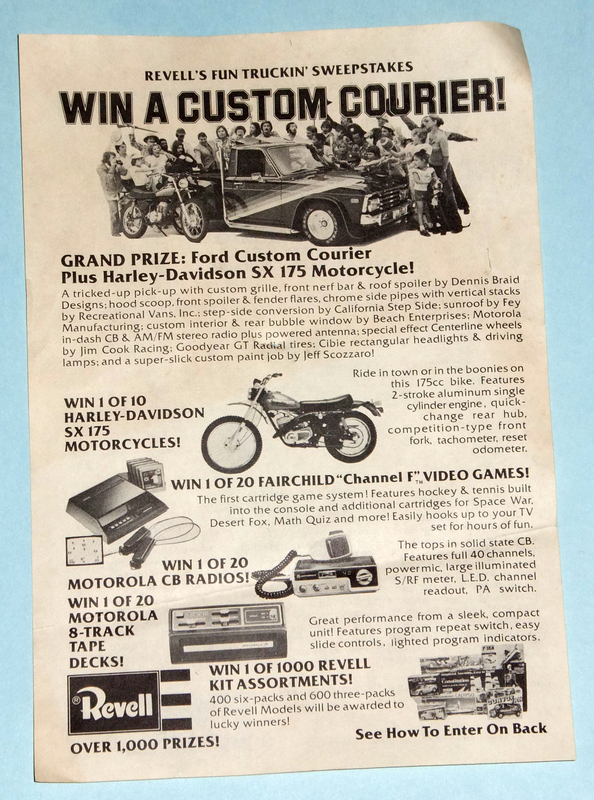 The main prize, though, is a Ford Courier truck, which, as you can see by the enclosed flyer, is quite modified in the vannin’ and show-rod tradition! 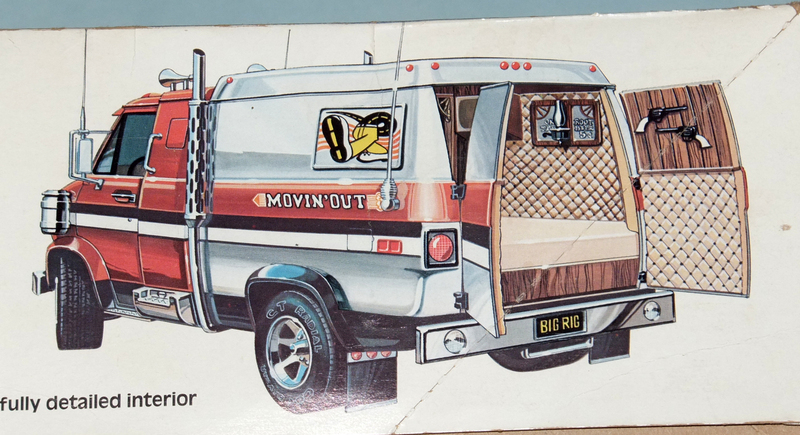 Because a huge van kit isn’t enough… you can also win awesome ’70s prizes. It’s too bad I just missed the deadline, eh? Yes, it’s taken us this long just to get to the kit. You have to remember, this thing is HUGE, but EVERYTHING about it is big, so just working our way into popping the top on this bad boy is a major undertaking. 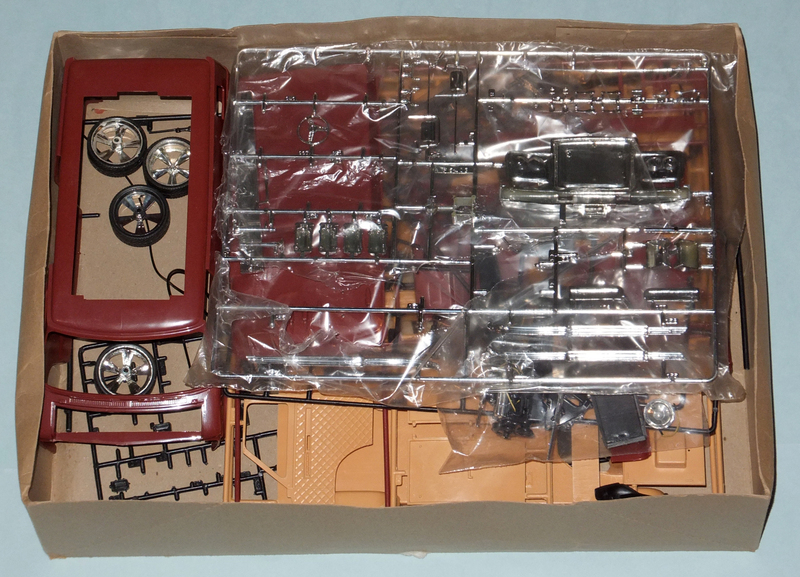 Inside the box are numerous sprues in various shades of reddish-brown, goldy-tan, black, chrome and there’s even a rack of smokey clear transparent parts. The first thing I thought of when I cracked this thing open was how much like a big, big Gundam kit it was. Lots of parts, lots of colours, lots of fun! However, it’s backed up by a lot of apprehension in this case. Is this kit buildable? Is it even complete? This is what I was most worried about; after all, it was second hand, and it was at least 40 years old when I got it. So, this is how I found it. The odd tires (seen through the roof at the top of the picture) did not make me feel any better. There’s no worse place to try and determine the completeness of a kit than on a small table at a crowded toy/model/nostalgia show. I was, however, dreading the outcome of my parts check when I noticed that the wheels and tires were missing. In their place was a set of very large (likely 22” in their original scale) wheels and tires. These are very modern, and don’t suit the van at all. 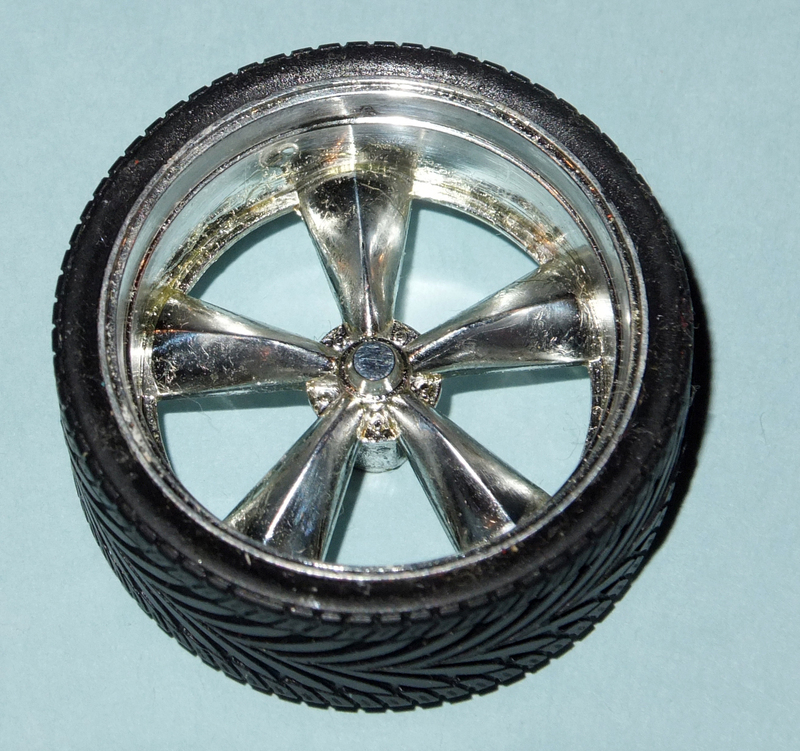 Clearly, someone wanted the original wheels for something, because they, the tires and the associated hardware are all gone. This sucked. I don’t like the modern wheels, they don’t suit the van, and they may or may not fit. The van did come with nice rims and tires, but they’re too modern for it. Still, better than having it up on blocks. Regardless, I decided that I might find the correct wheels somewhere, and if I did, I’d feel bad if I didn’t have a van to go with them. I negotiated the price down thanks to the “wheel deficiency” and proceeded to walk around with a knotted stomach until much later when I finally got home and found that, yes, everything else was, in fact, in the box! The engine had been started, but that’s okay; I can fix that. So, overall, just the wheels are an issue. Pretty good for an old kit like this, where so many pieces aren’t in their original bags. If there’s one thing that makes buying a second hand model nerve-wracking, it’s trying to determine if all the pieces are there. Normally, on an American car kit, the instructions are only of some use. Unlike the Japanese who neatly show you a layout of all the different parts on the runners, most American car models are just a mish-mash of racks, or in the case of MPC, rack stubs. Parts are used in whatever order they are needed, and that’s just that. In situations like this, where the parts are loose, and you don’t know what’s missing, it can be hard to find “Part x” in a multi-page instruction book. Thankfully, Revell came to the rescue on Movin’ Out! How? The answer is amazingly simple. Every part is used IN ORDER. Thus, if I knew part 66 was missing, I could flip through the instructions until I found I was in the neighbourhood and then look up wat 66 was. Thanks to this wonderful and seemingly unique system, I was able to find what pieces weren’t on the rack, and verify that they were in the small baggie of bits I got with the kit. I guess I shouldn’t be surprised, though, really; there is some tie-in with Japan on this kit. The tires and tubing were made there, so maybe they also had some good ideas on instructional awesomeness that rubbed off on the Revell folk? The first thing that you notice upon seeing this kit is that there are a lot of parts, and they’re big. The box is quite full, with the monstrous body shell taking up about a quarter of the box. The kit comes moulded in several colours, including brown for the main body, beige for a lot of the interior, black and of course there’s a chrome rack too. This rack is particularly impressive, since it has the “big rig” grille on it. There’s also a rack of smokey clear parts and a bag of various sizes of wire and tube. In my case, there weren’t any legit tires, but there were the four “dub-style” tires/rims that should work okay. 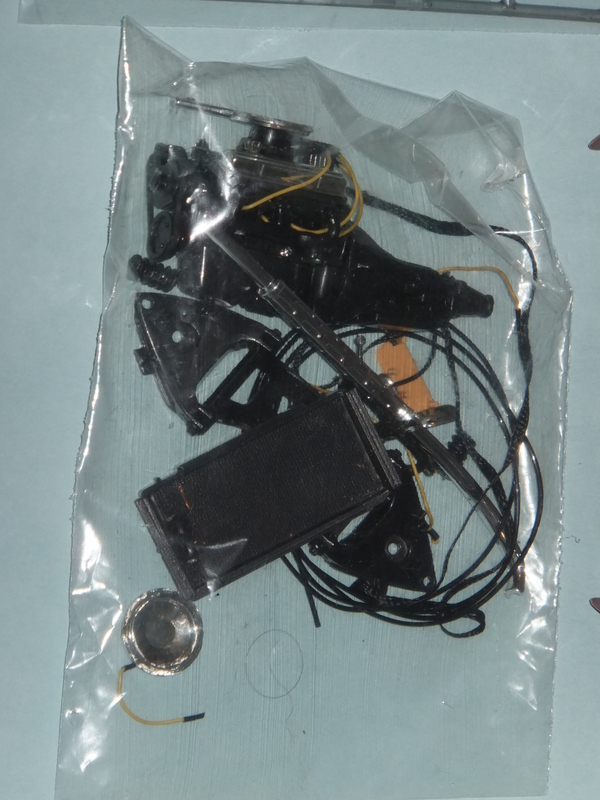 In addition, my kit had the started engine and a few other loose pieces in the wiring bag. Not legit, but definitely helpful to help contain the strays! This is SOME what is in the large box. That’s a lot of pieces, and the bag’s got the engine and a few more bits. This is the rest of what’s in the box. There’s just too much to fit into one picture! 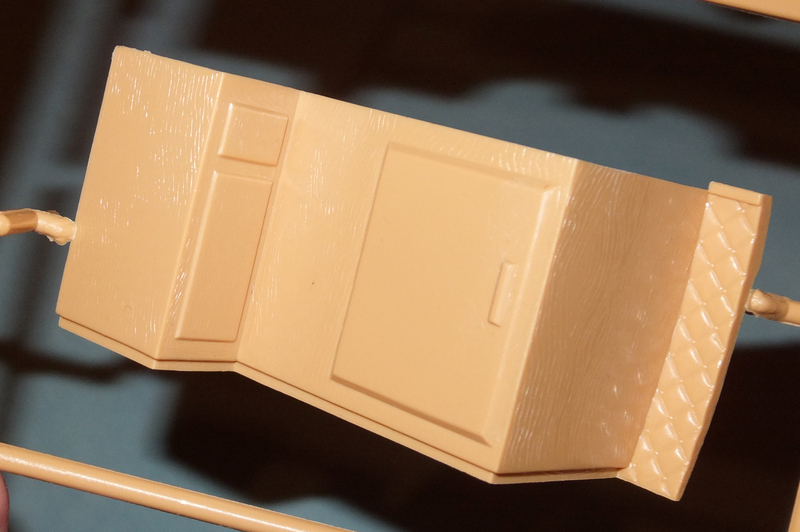 The moulding is quite good; it’s clear that this is a fairly early version of the kit, since there’s not a lot of “lazy” detail, and the flash is nearly non-existent. 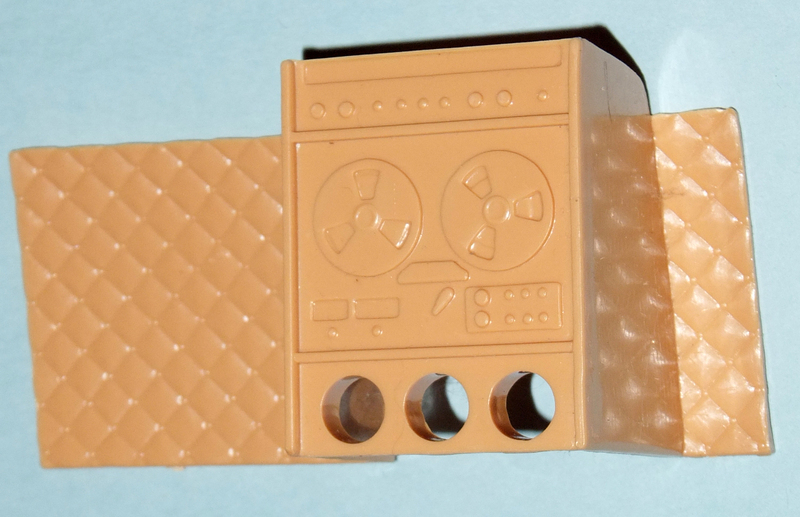 This is something of a miracle in a ‘70s American car kit, as anyone who’s built one will know! One thing that needs to be said, while not needing to be said, is that this kit is HUGE. I know that’s obvious, but until you hold one in your hands, it’s not obvious. To give you an idea of just how big it is, I got my 1/20 Highjacker and my reissued “Bad Company” ; You can see a couple of pictures below of just how Movin’ Out stands up to, and really just crushes, the competition. I mean, it literally swallows them whole, like Monstro making a snack of Pinocchio! This is how the three major scales of van compare. Bad Company (1/25) is at the bottom, then Highjacker (1/20) and finally, Movin’ Out (1/16). Yum! Lunch! Movin’ Out can swallow all other vans whole without working up a sweat. 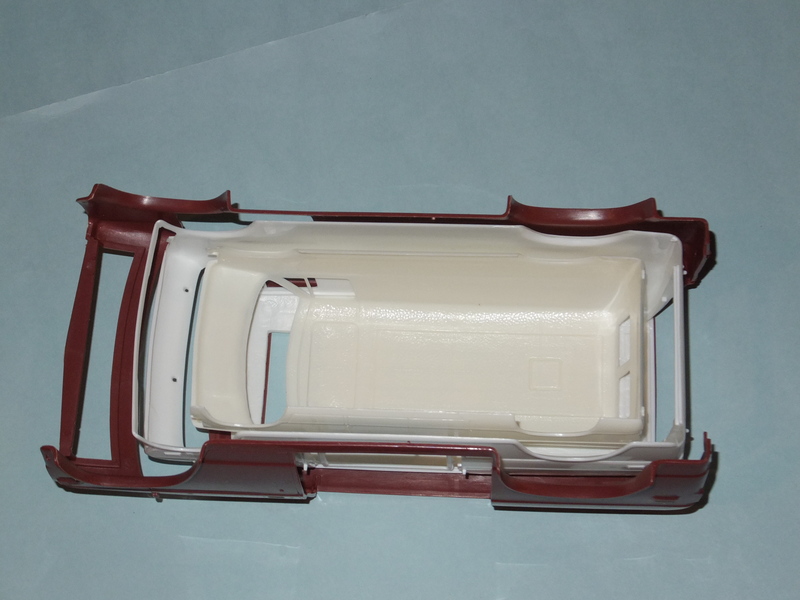 As I’ve said before, the most important part of scale vannin’ is the interior. With a canvas as big as Movin’ Out, keeping the interior both well-detailed and busy enough is essential. If you don’t do this, all you have is a rolling box, and a lame one at that! However, there’s no danger of that, as the detail on this bad boy is intense. All the awesomeness shown on the box is present and accounted for, and it all looks great. There are so many surfaces of diamond-tufted Naugahyde that it’s scary! The good news is they’re all beautifully rendered. Here’s an example of the studded, or diamond-tufted Naugahyde that adorns man of the interior surfaces. Beautifully done. On top of that, the ribbed seats are beautifully reproduced too, and in the proper spectrum will, I’m sure, look every bit the part they are supposed to play. Not only that, but the woodgrain! Oh, the woodgrain! It’s not a true Show Van without lots of woodgrain to stare at, and Movin’ Out has you covered! Since there’s a “Western” theme to the van, this isn’t a surprise but it is so nice to see this level of detail so well executed on a kit that is no spring chicken. Or buffalo, or whatever manly animal you want to use. This shows the nice “woodwork” in the van. 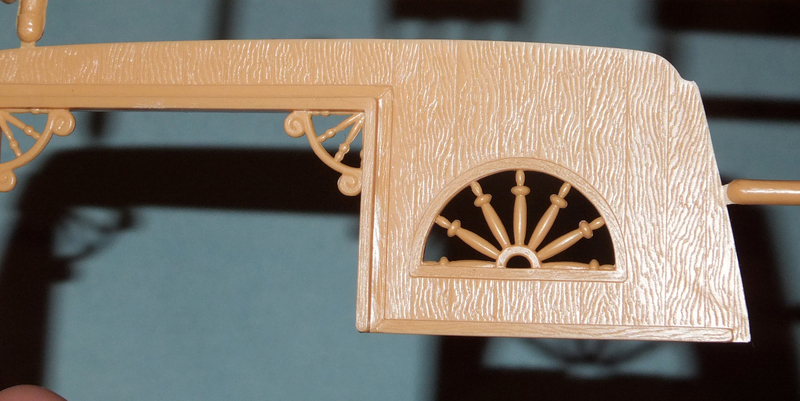 The wood grain is beautiful, and while there are some seams on the spindles, they are, largely, very nicely rendered. The shag carpet cannot be forgotten either, and the casting of the floor surfaces is definitely textured. At this scale, there’s more room to make a finer nap, and Revell pulls it off okay, but it’s not as well as their wood grain. The carpet is a bit too patchy, looking more like the surface of a low-detail Triscuit than groovy shaggin’-wagon floor covering! It might look a bit odd with conventional pastelling approaches, so I’ll have to see if a more advanced approach to detailing it is necessary. This is likely one van where traditional flocking would work out quite well. Of course, there’s more than just wood grain and shag to be found in a van of this caliber! One of the staples of the Show Van was domed leather. Well, okay, Naugahyde, most likely, but still, it had to be domed! As expected, there’s a tonne of this stuff throughout the Movin’ Out interior. It’s on the walls, it’s on the door panels, it’s basically wherever there ISN’T wood or shag! The Naugahyde is well done, and it’s going to look AMAZING with a wash to give it that oh-so-trying-to-be-leather colour variation that is a trademark of this interesting, and largely forgotten, material. The tape player is a very interesting piece. It’s not super detailed, and it doesn’t have a tape loaded. However, it does have reels mounted, so you’ll have to draw in or fab up a tape of some kind. The detail on it is a bit shallow, and it is something akin to the old tinplate toys where there is an illusion of depth, but no actual depth itself. Still, with some paintwork and creativity, it will certainly be able to LOOK the part, even if it’s not quite right. Where else are you going to get one of these in a van? Right, so quit your quibblin’! Oddly, the receiver/controller on the top doesn’t have a top, so it’ll be hollow when you open the roof to look in. Sounds like a job for sheet styrene! Feel the beat! This ever-so-groovy reel-to-reel tape player comes with its own Naugahyde panel, and slots for three bottles of refreshments. Your measly i-Pod CANNOT hope to match this. That’s right. TWO dials. VHF and UHF, baby! Add that it’s likely black and white, and you know there’s no infotainment system like it today! This is one extensive van, and it literally includes the kitchen sink, as well as what is likely a small fridge. The sink does come with a chrome faucet, which is cool, too. There’s also a small overhead console for the driver/passenger. 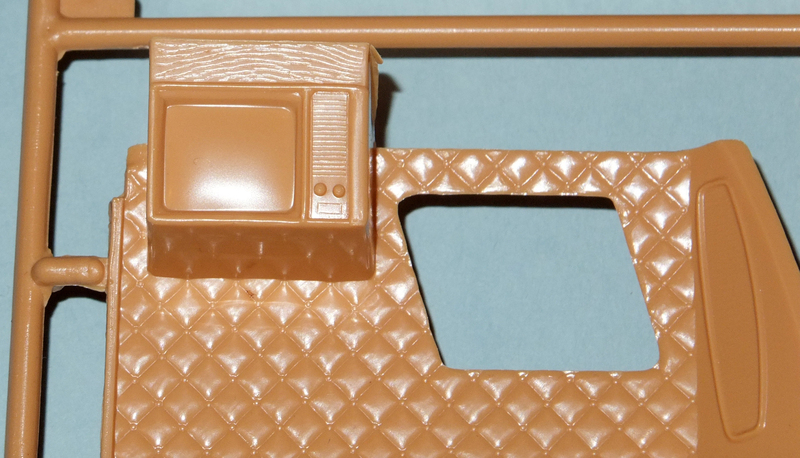 Sadly, the moulding on this piece isn’t great, but it’s good enough to let you see the CB radio up there! OF COURSE there would be a CB radio… Not only was it the ‘70s, this is a BIG RIG van! It’s not just the interior that’s detailed, either. The engine, being huge, has a lot going on too. The accessories are separate, multi-piece parts, and even the transmission is a separate pair of halves! Heck, before you even get to that, the first step is to put the block together – from FIVE pieces! It’s built more like a model boat than an engine! Most of the accessories, too, like the starter, distributor, pulleys and fuel pump are two pieces as well. This thing is really an engine on a cosmic scale, and for anyone looking to do a crazy amount of super detailing, it’s unlikely to come any better than this! Of course, you don’t even have to be a super-detailer to get the ball rolling, because Movin’ Out comes with wiring for the engine. Now, I’m sure a lot of car guys are not really that impressed, but there’s more. Due to the sheer size of the kit and the scale of the engine, there are also simulated wiring boots at the ends of the wires!!! Small pieces of rubber tubing are used to simulate the boots and add even more realism. The engine alone on this thing is a separate kit! Here’s the started engine and some of its tubing. I think the belt elastics are in there too. If there’s one thing upon which most car modellers can agree, it’s that the belts on model car pulley setups never look right. They always look fake, and no matter what you do, unless you build support arms for the various accessories, they look odd just hanging out there in space, held up by the belts. It’s just one of the limitations of things, and until the ’64 Chevy Fleetside, I’d never seen a kit address it. On Movin’ out, the alternator is glued to the engine block, and a real rubber band is stretched around the pulleys! I don’t know if my kit has the band still, I will admit, nor would I wager on its soundness after 40-odd years. 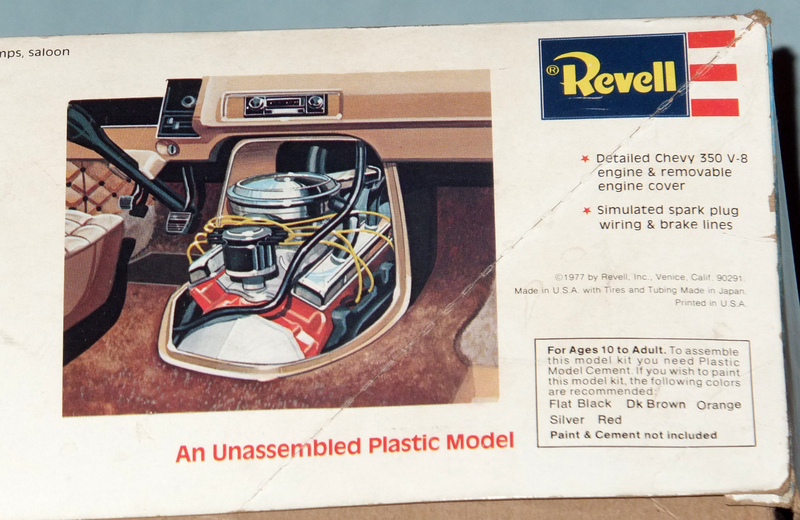 Still, it’s an awesome idea, and I give Revell kudos for even thinking of it. All this awesome has to have something to hold it all together, and like any great vehicle, the frame and suspension of Movin’ Out are that stalwart foundation. The frame itself is a typical full-frame as found in almost every van kit. It’s not super impressive, on its own. However, it is huge, and it’s got a bit of detail on it. Where the kit really shines “down there” is the suspension and steering setup. The gearbox is made from 4 separate pieces and the idler arm from 3. There are lots of moving parts in the suspension, because the wheels are intended to steer! To be honest, I don’t know how it will work… it strikes me as typically over-gimmicky and complicated for the era. However, perhaps the humungous scale will help things out, and it won’t be as delicate and fidgety as it looks. One thing I did not find impressive, I will admit, is the fact that the springs are just plastic, and cast in halves at that! With all this other deluxe stuff going on, you’d have thought they might have sprung for real springs!!! Alas, that’s not the case, and I fear that the springs will not only be hard to make look good, but that they will detract from the otherwise impressive suspension simply by being there (no matter how well they turn out)! In addition to wiring for the engine, there’s tubing provided for brake lines (I think) and some kind of line from the engine bulge in the cabin floor to the frame. I have no clue what it is, and they don’t say. However, I assume it might be for wiring harnesses? One of the oddest parts of this whole kit is that while there are tubes for everything, the radiator hoses are solid plastic. W.T.F.? The one place that NEEDS actual rubber and they elect to go with styrene. Huh. If you have some heat shrink tubing and some solder, this is a good place to use them to make nice rad hoses. That should work out well, I think. 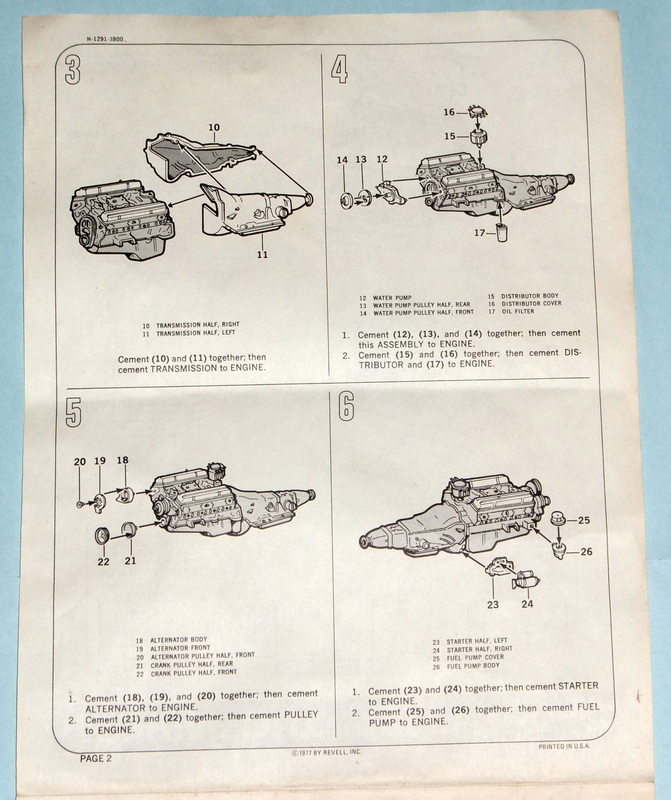 The instructions on final assembly are much more involved than on a typical car. 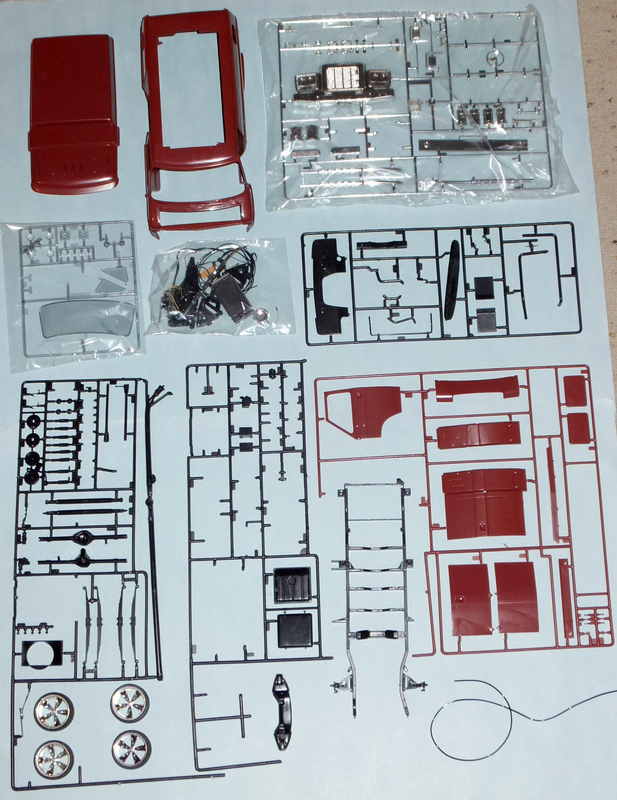 A lot of the normal bits are left to near the end, like the assembly of the steering wheel and seats. One thing that is amazing is that this car actually has seat belts. Fabric seatbelts! It comes with a black braided fabric cord that you cut into pieces and to which you attach actual chromed belt buckles. 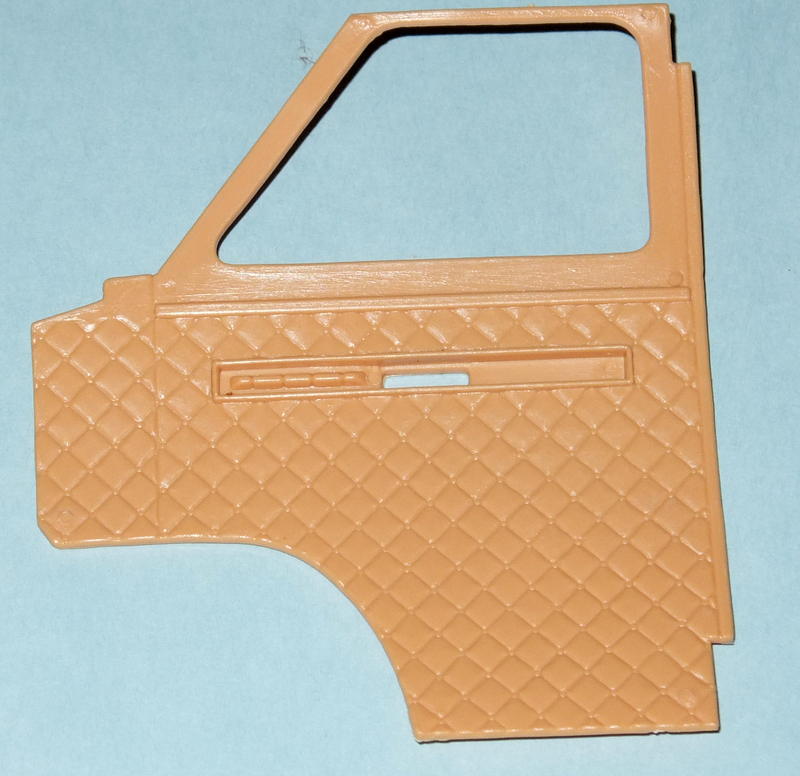 These are then glued into place on the floorpan with hold downs, just like they would be, I assume, on a real van!!! The only other kit of anywhere near this age that has seatbelts is the Jo-Han Olds F-85, and those plastic lap belts are a far cry from this! The rest of the “big rig” bits go on at the end, and one thing that surprised me was that the side door is left closed. It’s clearly designed to be open, since it’s moulded open on the kit. This is just like the driver’s door is also optionally openable. In its “Big Bad Van” form, it was undoubtedly designed to be optionally opened. However, the “big rig” pretentions of Movin’ Out have made that an impossibility. Part of the “big riggery” is moulded onto the panel that would have been one of the side doors. This means that if you want to open a door on the side, there’s only going to be one door that can open, and you’ll have to do a lot of cutting and hinge-making to make it work out. It’s a lot of work, but how else can you see all that luscious, ridiculously overdone interior? Simple, just don’t glue on the roof! It’s designed to be removable, and that’s likely the best option regardless. I have mentioned the instructions before, and you’ve seen numerous panels from them above. They booklet in which they come may very well be the single most useful, informative and well-organized example of the instruction-maker’s art. They are likely to be unsurpassed in this age of CAD-modelled precision and sterility. They are very visceral, but very, very clear. They are simple, but complicated enough that you’re not left wondering “Is that this part?? ?” when you compare diagram to plastic. Most importantly, though, they are, by and large, unconcerned with looking good. They look good because they ARE good. They’re not fancy, but they are supremely functional and clear. This is an example of the instructions. Not only are they clear, they’re a great learning/teaching tool. Plus, all parts are used in numbered order! So, soooo smart. This is the final assembly portion of the instructions. Once again, clear both pictorially and verbally. A masterwork, I say. The Decals are actually the least interesting part of the kit. Mine have been a bit water-damaged, but I doubt I’d use them. For a van so “big” in “rigness”, the decals are very tame. The “gimmick” graphic is a road, flowing into a pair of pants culminating in an upraised “road-soled” shoe of oh-so-70’s proportions. It’s funky, it has soul (sole?) and really… that’s it. It’s not big, not colourful, not much of anything, to be honest. A van with this much attitude, in this huge a scale, really, really needs more. THIS is the van you go to town on with the biggest mural you can find. On top of that, the decals aren’t very good. There’s some striping that’s okay, but boring, and the “mirror” decals are very poor. They’re out of register, sort of. I think it’s supposed to be that weird “bar mirror shadow font” (You know what I mean!) but on a decal, it just makes things look out of focus. To me, the decals are NOT why you buy this kit. Add to this that they’re old, a bit damaged and likely won’t work, and you’ll find me just writing them off regardless. Interestingly enough, this kit was reissued in the 90’s as a Revell Germany kit, with much more appropriate decals, as well as lights for the head and tail lights and a speaker that plays something, although I can’t find out what. Some cheesy ‘70s “blue movie” soundtrack, likely…. Seems appropriate. This van is a magnum opus in so many ways. It exemplifies what is perhaps the pinnacle of the North American model car, in that it is part precision and loving detail, and part crude overkill. There’s so much to like, no, to love. However, an objective analysis reveals that, despite the best efforts of the model makers at the time, there are so many features that could be better done. The decals are weak, and some of the detail is soft in the interior. The tape player’s a perfect example of something that would have been well served by several separate pieces. There’s no real carpet, and the floor texturing is a bit crude, looking more like burlap than shag. It’s also unfortunate that the side door doesn’t seem like it can open, at least not without some creative surgery. However, despite all these shortcomings, I can’t find myself doing anything but loving this model. It has tonnes of features not seen on other kits of this vintage or ilk, and due to its size, it’ll make every subassembly seem like its own kit. It’ brilliant instruction manual, parts numbering layout and approach to building the kit are all zeniths of the model-maker’s craft. Despite the size of it, or perhaps because of it, this kit can be built by anyone. Whether you can’t handle small pieces because of eyesight issues, or because you’re inexperienced, it won’t matter. There really aren’t any small parts! Add to this the excitement of seeing your work produce subassemblies that are both technically complete and physically massive, and this model can be enjoyed by everyone. Despite the fact that I don’t have the correct wheels and tires for this, I am very glad that I bought it for my collection. I really do hope to build it one day, and who knows, maybe I’ll find the right wheels/tires somewhere else, or someone will have some they don’t want anymore. 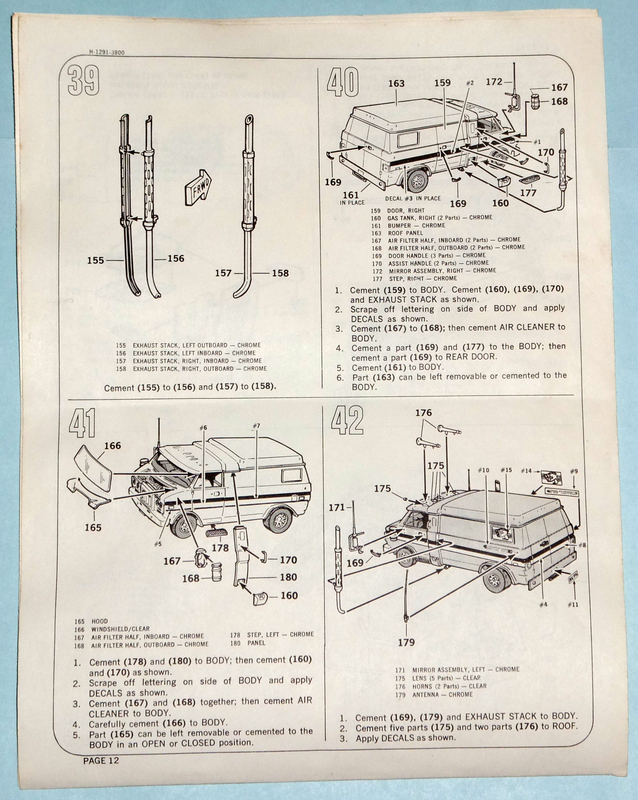 Regardless, just having this van, its Zeitgeist-gushing box and its awesome instruction sheet to sit and admire is a great honour it its own right. It’s a shame I can’t enter the contest anymore, but I doubt I’d have won the Courier anyway. All in all, this is a massive kit that’s a massive blast. I put it up to celebrate my 250,000th hit, because that’s a big milestone for me, just like this kit is a big milestone for scale Vannin’. If you like vans, big car kits or just want an excuse to grow a moustache like the late, great Burt Reynolds, then this kit is something you need to search out. You will NOT be sorry.